The Rising Phoenix: Host City Plugs! Ashley had a slideshow and a video. His group, Hotline, has "many many experiences" in hosting public events that are over 1000 people. They hold an annual funding charity party, every year. His city has the biggest LGBT Pride in Asia, he reminded us – and it's not a Pride Parade, because it's more than a parade: it's part of a social movement - a 70,000 bare-naked party of a social movement! "I would like you to join us so you can all come to this Pride," he said. The slideshow - don't know if I can get pics - included a trio of boys bringing a rainbow flag all over Taiwan, to all its temples and Buddhas and touristic landmarks. Ashley: We have also very delicious street food. (pointing) That is also one of our delicious street foods –Taiwanese boys! Jennifer: And girls! And we have very good lesbian parties. And we have very good connection with universities. A lot of us know about Angkor Wat, Srun Sron said, but he's not here to talk about civilisations. He too has experience with big numbers: his group hosted the 3,000-strong ASEAN Grassroots People’s Assembly. Hotel costs are super-cheap, he added. Also, 63% people of people are young! (Not sure whether he was talking about youth outreach or eye candy.) Good travel connections with all ASEAN countries already, except Brunei. 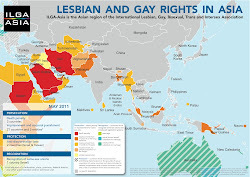 Oh, and Prime Minister Hun Sen's announced that the country supports the LGBT community. The Ministry of Tourism's also declared that Cambodia's a beautiful country for gay people! There are now a big gay club and fashion shows in Siem Reap!